Zeena is a dynamic, enthusiastic and holistic body practitioner. She began her exploration of the body through movement, sports and dance at a very young age. 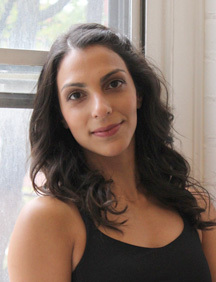 She pursued professional training in contemporary dance through a B.F.A. at York University, and later at LADMMI (l’école de danse contemporaine) in Montreal. This training honed her personal athleticism and performance while developing her knowledge of anatomy, palpation, biophysics and postural/sensory awareness. Zeena is excited to bring her unique skills to her osteopathic manual practice. She is completing her fifth year at the Canadian College of Osteopathy in Toronto. Her treatments include various techniques, such as: cranio-sacral therapy, muscle energy, strain-counterstrain, myofascial release, and visceral work. When Zeena is not in school or acting as co-ordinator of the Yogaspace Wellness center, she is working as a personal trainer, (for the last six years). Specializing in functional movement training, she offers a variety of exercise styles from a somatic approach (training the nervous system through refined movements), to an explosive, ‘Boot Camp’ style approach (incorporating plyometrics as well as circuit and interval training). Either way, she provides the tools to educate, stimulate, motivate and challenge her clients to achieve and surpass their health and fitness goals. Injury prevention, is of course, always a priority. Zeena is CPR certified and bilingual in French and English. “For the first time in weeks, I’m feeling a change in my body!! The pressure that I felt in my chest/lungs has finally lifted and I feel like I can breath again! I’m still achy but not nearly as much. I’ve even started stretching a little! I barely moved all weekend and it seems to have really paid off. I will definitely book another appointment when I’m back, just wanted to let you know you’ve saved my body!! Thank you! Thank you! Thank you!” – T. M.